ACHMM-India Chapter with the support of Karnataka State Pollution Control Board and Institute of Engineers India, Karnataka Centre organized a two-day Indo-US Seminar on Current and Future Trends in Environmental Management from October 20-21, 2016 at Bangalore Institute of Technology, Bangalore, the silicon city of India known for its air-conditioned weather. The themes for the two-day seminar were Measurement of Volatile Organic Carbon Compounds (VOCs) and Transport of Dangerous Goods. Ten CHMM delegates from the United States arrived on October 20, 2016. On October 21, the delegates visited Poornapragna Institute of Research Center near Bangalore. Ms Adriane Borgias, US Fulbright Scholar-2010 gave a presentation to the research workers of the Institute on contamination of PCBs in rivers. After the program, delegates left for Nandi Hills which situated at an altitude of about 5000 ft to enjoy the spectacular view of the surrounding area. On October 22, 2016, the seminar was inaugurated by Mr. Vijay Bhaskar, Additional Chief Secretary to the Government, Department of Environment and Ecology. In his inaugural address, while wishing the seminar a great success, Mr. Vijay Bhaskar complimented such activities by educational institutions and assured to take positive action on the reasonable and implementable recommendations submitted to his office as outcome of the seminar. Dr. Rampur Viswanath, AHMP-International Ambassador; Founder & President, ACHMM-India Chapter; US Fulbright Scholar-2015 who led the US delegation, initiated the discussion and emphasized the immediate need for VOCs measurements in all major cities including Bangalore to address serious health effects. Dr. Anjali Srivastava, retired Chief Scientist and Head, New Delhi Zonal Center of National Environmental Engineering Research Institute made a presentation on Issues in VOC Monitoring and Reporting, Ms. Kendra Schroer talked on Exploring Unexpected Sources of VOCs. In the panel discussion that followed, Dr. Anjali Srivastava suggested an easy method of evaluation of Total VOCs using a GC which could go as a recommendation to the Government. The two-day seminar was attended by 60 participants representing academia, industry and officers from the enforcement and policy making bodies. On October 24, 2016, the seminar theme was on Transportation of Dangerous Goods. Mr. Sasi Cehmmenkottil, Vice President, Total Oil gave an overview of Transportation of petroleum products at his industry. Delegates from USA including Mr. Joe Jenkins, President, AHMP, USA; Mr. Bruce Donato and Mr. Richie Spangler talked extensively on other aspects of the theme covering Shipping, Packaging, Marking, Labelling and Placarding. On October 23, 2016, the delegates left for Mysore, an historical place ruled by the Maharajas (Kings) of Mysore for more than 500 years. Mysore is a relatively small town known for palaces, silk garments, sandal wood articles, jasmine flower, Carnatic music, paintings, KRS dam, Brindavan gardens, centuries old market place & University colleges and beautiful administrative buildings and clubs constructed during Maharajas time by British architects. From October 25-27, a three-day training course on Hazardous Materials Management was held at the JSS University. This was organized by ACHMM-India Chapter jointly with the JSS University Department of Environment Engineering. During the inauguration of the course, the Vice-Chancellor of the University expressed his intention to start an AHMP Chapter at the University to hold seminars, workshops and courses on HMM every year by inviting CHMMs from the USA. Different topics on HMM were presented by the US delegates comprising Dr. Rampur Viswanath, Ms Kendra Schroer, Ms Adriane Borgias, Mr Richie Spangler, Dr. Brandan Borgias, Mr. Joe Jenkins, Drs Bruce and Karen Donato. 150 Participants representing students of B. Tech and M. Tech in Environmental Engineering, research scholars and teaching faculty of Department of Environmental Engineering of the University attended the program. Ms Kendra Schroer, Assistant Team Lead meticulously planned the session’s time table for the three-day course. Participants deeply appreciated the efforts by the US delegates and showered their affection after the program by taking selfies while talking to them for half a day. Variety of delicious South-Indian spicy food items were provided to the delegation at the prestigious Sports club, Golf club and Race club built by Britishers under the patronage of the Mysore Maharajas. Delegates visited the world famous Mysore palace, Mysore Silk manufacturing unit, Chamundi hills, and 800 year old architectural wonder at Somanathapur near Mysore, known for rock sculptures. On 25th October, the delegation left by bus for Ooty, a hill station situated at about 7000 ft and enjoyed the scenic beauty of the place with gardens and tea estates all around. A train journey to Botanical Gardens at Koonoor was also arranged. Ms Katherine Allred, an environmental activist and a Rotarian who accompanied the delegation was a great company with her wit and subtle humour. Mr Ramesh, a member of the chapter who accompanied the tour took pains to make all the arrangements both at Ooty and Mysore. Ramesh’s family members who are residents of Ooty hosted lunch and dinner. On 29th October, the delegation left for Bangalore airport by bus. On the way, they were taken for a Safari ride at the Wild Life Sanctuary at Bandipur forest. Hospitality transport and stay at Mysore and Ooty were all sponsored by the JSS University, many thanks to Professor Manoj Kumar. Kathy Allred, Joe Jenkins, and students at the Poornaprajna Institute of Scientific Research plant a sapling. The trees in the background were planted 6 years ago when the Institute began. This was our rest day. We ate breakfast, lunch, and dinner at the food court on the ground floor of the hotel (Cross Roads Inn)—non-vegetarian food is not served in this hotel. Arrangements could be made for delivery in the room or be taken to a nearby hotel for non-vegetarian food. Alcoholic drinks could also be served on demand to rooms on payment. We took a tour of the Poorapajna Institute of Scientific Research (PPISR), a 6 year old research institute staffed by 25 of the top scientists, engineers, and students who research nanomaterials, polymer membranes, catalysis, microbiology, and quantum information. We were welcomed by Dr. A B Halgeri, Director of PPISR. Then, the US delegates were introduced by Dr. Rampur Viswanath. Ms. Adriane Borgias and other US delegates spoke on environmental issues. It was a fascinating day meeting many of the students and professors capped off by a tree planting ceremony. Our group planted 4 trees to go with trees planted by a previous delegation that had toured the research institute. The Delegation at the Poornaprajna Institute of Scientific Research Delegation members are Adriane Borgias, Karen Donato, Kathy Allred, Bruce Donato, Joe Jenkins, Richie Spangler, Brandan Borgias, Rampur Viswanath, and Kendra Schroer. Also pictured are Dr. Jai Prakash (6th from right) and Dr. Bhat 4th from right). More names to come. Joe Jenkins was excited to interact with the native animal population. After Breakfast at Cross Roads Inn, we went to the Bangalore Institute of Technology, where we enjoyed an inauguration and a session. We then had a Cocktail Dinner at the Karnataka State Cricket Association (KSCA)–Diamond Box, hosted by Institute of Engineers (India), Karnataka Centre. On the first day of the Indo US Seminar on Current and Future Trends in Environmental Management, Joe Jenkins, President of AHMP, was invited to sit at the dais (stage) and participate in the lighting of the flame ceremony that officially began the seminar. Mr. Rampur Viswanath, AHMP International Ambassador and coordinator for the India information exchange is pictured. On the dais with the hosts at the Bangalore Institute of Technology (BIT), Dr. Jai Prakash, Joe Jenkins, Prof. R.M. Vasagam, Mr. T.M. Vijay Bhaskar, Dr. A.G. Nataraj, Dr. Rampur Viswanath, and Dr. Aswath M. U. What an incredible honor for Mr. Joe Jenkins to be invited to participate in the lighting of the flame ceremony at the inaugural ceremony for the seminar. Ms. Kendra Schroer presented a fascinating look at unexpected sources of VOCs. 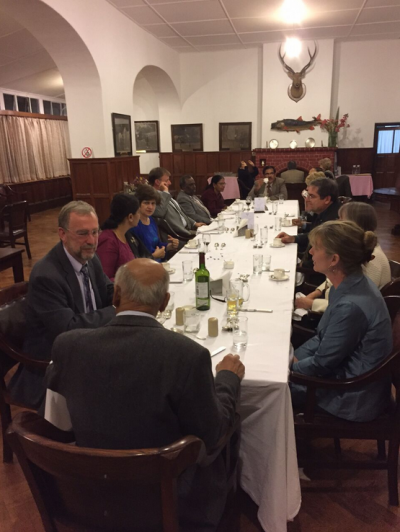 We went to the Bangalore Institute of Technology at 8:45 am, attended sessions from 9:00 am to 5:30 pm, then enjoyed a cocktail dinner hosted by ACHMM-India Chapter. Richie Spangler presented the majority of the daylong seminar on Transporting Dangerous Goods. After Breakfast, we checked out of our hotel in Bangalore to head three hours away to Mysore, India. When we got to Mysore around 12:30 pm, we had lunch, then set off to visit Mysore Palace. We also walked around the market place then had dinner at Mysore Race Club. We left the hotel at 7:00 am to have breakfast at the Golf club before a day full of workshops at the University of Mysore's Sri Jayachamarajendra College of Engineering (SJCE). We attended workshops and sessions from 11:00 am until 6:00 pm and then visited the Cauvery Handicrafts Emporium from 6:30 pm to 8:00 pm. Dinner was at the Mysore Golf Club. We returned to the hotel at 10:30 pm. Jockeys practicing while we ate breakfast. Dr. Brandan Borgias teaching to a full house at Mysore University's School of Engineering. After indulging in breakfast at the Golf club and sessions at the SJCE, we headed to the Chamundeshwari Temple located atop the Chamundi Hills above Mysore and learned the story of Mahishasura. Mysore at night during the festival of Diwali. Bruce and friend at Chamundi Hills above Mysore. We enjoyed breakfast at the Golf club and sessions from 9:30 am to 1:30 pm. After lunch, we visited the Mysore Silk Weaving Factory between 2:00 pm and 2:30 pm, then went to Chennakesava temple, a historic Somanathapura heritage temple (800 years old known for its fine architecture and carved sculpture in stone). We returned for dinner at the golf club and went back to the hotel at 10:00 pm. The educational delegation and our students and sponsors at Mysore University. At Chennakesava temple, we had the temple to ourselves at sunset. The Chennakeshava Temple was built on the banks of the Yagachi River in Belur by the Hoysala Empire King Vishnuvardhana. Belur, which was an early Hoysala capital, is in the Hassan district of Karnataka state, India. On our last day in Mysore, we checked out of the hotel at 7:00 am, had breakfast at Golf club, and got to the Ooty Preethi Classic Towers in Ooty at 12:30 pm. At 1:00 pm, we had lunch at Ootacamund Gymkhana Club, an old British style officers club and golf course. Then, visited the Botanical Gardens and had Cocktail Dinner at Ooty Gymkhana Club hosted by Sri. Balalingiah. Before dinner at the Ooty Club, we played snooker at the place and on the table the game was first played. “The term 'snooker' was given to the game by Colonel Sir Neville Chamberlain in 1875 whilst serving in the Army. ... After being wounded in the Afghan War, he moved to Ooatacamund and the game became the specialty of the 'Ooty Club', with rules being posted in the billiards room.” www.snookerclubs.com/history-of-snooker.htm. Pictured is Bruce Donato taking a shot. Dinner at the Ooty Club hosted by Sri. Balalingiah seen speaking with Joe Jenkins and Kendra Schroer. At 7:00 am, we packed our breakfasts for our 2-hour safari through the Bandipur national park. We saw elephants, spotted dear (Chital), black faced monkeys (langur), and wild boar. We also saw grand eucalyptus forests and coffee and tea plantations. At 11:00 am, we headed back to Mysore to have a quick lunch at the race club and then headed to Bangalore Airport (a number of us headed north to New Delhi for more sightseeing). One of the many tea plantations around Ooty. Sunset in the mountains above Ooty. Eucalyptus forests on the drive from Ooty to Bandipur National Park. Chital (spotted deer) and langur (black-faced monkeys) were some of the animals seen in Bandipur National Park. After October 30, we all dispersed. Bruce, Karen, and I toured the Taj Mahal, Agra Fort, and Jaipur, where we rode elephants up to the Amber Palace. Joe Jenkins and Karen and Bruce Donato had a blast riding elephants at the Amber Palace in Jaipur. Mr. Bruce Donato shopping after classes. Scaffolding sales behind our hotel in Mysore.